Does the plagiarism level increase when an assignment is submitted through my checker before it is submitted to college? No. My checker shows the areas where there are potential threats to plagiarism.Not the actual ones. My checker only shows the internet sources. It is not linked to any university. We have never submitted student papers to any data base. It is always better to check the plagiarism of your write-ups before you submit them for final marking. This will ensure the originality and the citations of the writings as well as checking plagiarism helps to avoid the accidental plagiarism. The plagiarism checker software â€“ â€˜My Checkerâ€™ will do a quick and thorough check of assignments for similar work and missing citations. Using â€˜My Checkerâ€™ will ensure that your writings are plagiarism-free. 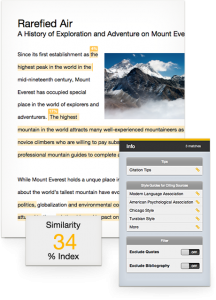 Once you upload a document to this plagiarism checker software, the document will be checked against similar sentences and phrases, and missing or inaccurate citations. Now you can get the best quality plagiarism check from â€˜My Checkerâ€™ due to its immense database of content which consists millions of student papers, published research works and billions of web pages. Within seconds of uploading your assignment, you will get a user-friendly view of plagiarism report. Each paper will include a Similarity Score and this would help you to compare your write-up with the content in our database, and this will quickly identify any writing that needs to be cited more correctly. Now you can check your paper for plagiarism with one of the best plagiarism checkers available. My Checker uses the same technology as Turnitin, which is immensely used online plagiarism software in the world. Write-ups will not be stored in My Checker Database, which means you can upload the same paper to Websites with copy rights. Over one million students have signed up with My Checker to check for plagiarism, and 90% of the customers are satisfied with the results.